Weird coincidences abound, don't they? On the day that I saw a preview of the delicious documentary, 'The Songkeepers' about the (mainly) women's choirs that are a key part of cultural maintenance in remote desert communities, I also caught up with one of the 'art' films that has been jointly bought by the Tate Gallery in London and the MCA in Sydney, which will probably have more influence in representing aspects of Aboriginal Australia to the world than 'The Songkeepers'. And that's a tragedy. Let's start with the good bit. It's all too easy to believe that the Missionaries who charged out bush in the late 19th and early 20th Century did nothing apart from pushing Christianity down the resistant throats of tribal people. I've never forgotten the reaction in Sydney to Jimmy Chi's musical 'Bran Nue Dae', with its Palatine priests much in evidence. “What was the Church doing getting such a sympathetic hearing?”, trendy Sydneysiders demanded. 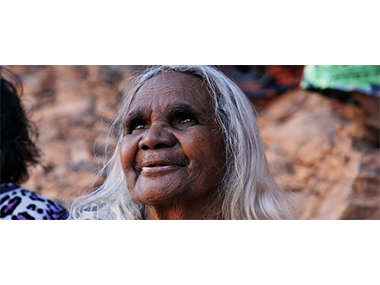 But, just as 'The Coming of the Light' (or Christianity) is celebrated faithfully every year in the Torres Strait, so the ladies of Ntaria (Hermannsburg), Docker River, Titjikala and Ernabella, talking and singing in a mix of Aranda, Pitjantjatjara and Pintupi, are just as comfortable in a church as they are out under the stars performing ceremony. The comparison was appropriately made with the role of boys' footy teams. And given the opportunity to take the Lutheran songs that German missionaries like Carl Strehlow had assiduously translated into their languages back to Germany, they practised and practised under the guidance of a Caribbean-born choirmaster, Morris Stuart, and jumped onto planes – many for the very first time. They even dug into their collective memories to produce the first hymn that their ancestors had learnt and returned it to Neuendettelsau, where Strehlow had studied for the church, and where his grandson received it emotionally. Interestingly, German churches seemed generally filled with women, not men. 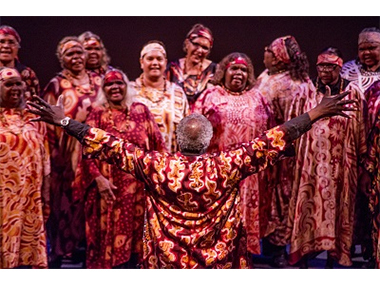 On the obverse side, the 32-strong Central Australian Aboriginal Women's Choir contained two men – one Indigenous and one not! 'The Songkeepers' passion was potent, even if the nasal tones of their singing has a distinctiveness that some may find of limited appeal. I recall that Andrew Schultz in his cantata about Strehlow's painful death procession – 'Journey to Horseshoe Bend' – used that distinctiveness brilliantly. But the film offers more than song. Several individuals are given their moment in the sun to place the music and the Christianity in context. Maintenance of language is a key message – for, as one songstress complained, the schools these days teach only in English. Shame! The complete freedom of the Aranda from massacres around Ntaria was a pretty powerful second message; and nor were there stolen generations there. Theresa Nipper, a self-defined half-caste, owes her life to the missionaries who took her and her mother in when the tribal rule was that such miscegenated babies should be left out in the sun to die. Even the offspring of a full-blood couple might be killed, another woman told us, when the husband had died before the birth. “Now our laws have been changed”, insisted the lucky survivor, underlining that Christian values have rightly replaced the necessary rules of a nomadic society. And the youngest chorister from Titjikala admitted that her parents' death tempted her to go astray as a teenager – but then she found happiness through singing (and painting). Perhaps the film – directed by the Indian-born Naina Sen, who is no relation of the great Aboriginal director Ivan Sen – could have been a tad shorter. But in terms of it “representing Australia” - as the women proudly recognised they were doing – it's definitely a better option that Peter Kennedy and John Hughes's 'On Sacred Land', currently showing at the MCA in Sydney, but also selected in the five-year program supported by Qantas for showing at the Tate Modern in London. For it has all the earnestness of a 1980s white guilt-trip, featuring exploitative missionaries and totally regulated Aborigines, forced to dress, to march, to conform. There's a suggestion that performances of public ceremonies are just tokenistic, and that Land Rights protests are the only way to go as a Ministerial voice intones, “We are your friends”! Given the opening quote from a priest at Kalumburu in the far Kimberley in 1915 that Aborigines have a natural socialism which can only be improved by the benefits of individuality and competition, one can understand the film-makers' scepticism. But, clearly, theirs is not the whole story. 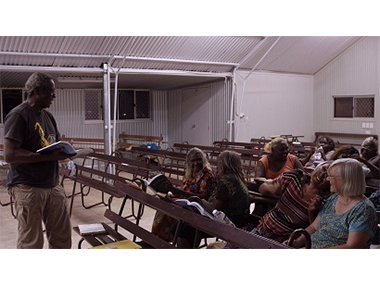 Only the Aborigines who suffered/benefited from the Mish experience should do that. Hopefully, the Tate curators involved in selecting further Australian works of art for show in London will actually get up into the North to consider the art by such people in June. The release date for 'The Songkeepers' is on April 19th at cinema nova, Lido cinemas, Classic cinemas, Cameo cinemas, Sun theatre in Melbourne; Dendy cinemas Newtown in Sydney; Dendy cinemas Coorparoo, Balmoral cineplex in Brisbane; Dendy cinemas in Canberra; and at the State cinema in Hobart. Then from April 26 in Geelong and finally from May 3 in Adelaide, Alice Springs and Perth.